MIPIM UK is the number one property show in UK and will be attended by over 4,000 delegates, offering a great platform for the Council to profile what the City has to offer, including over half a million sq. ft. of new city centre developments and a number of prime sites which have been earmarked for new hotel, retail and office development. The Council led investment team will promote the City under the banner of ‘The Right Combination’, and there is no doubt about it Lisburn Castlereagh City certainly has the right combination for investment; with the right mix of property and location, skills and talent; ambition and opportunity, as well as being Northern Ireland’s best connected, business friendly city. Many businesses operating in the area cite the convenient location, high quality workforce and superior broadband connections as the main reasons they chose to set up in Lisburn Castlereagh. Councillor Uel Mackin, Chairman of Lisburn & Castlereagh City Council’s Development Committee, said: “The Council’s Investment Team will be focused on ensuring that they get in front of as many key investors as possible, and to this end we are busy scheduling one to one meetings to take place during MIPIM. We are not content just to wait for delegates to visit the Council stand and are already sending out special invitations to key delegates we have identified across the UK and Ireland to visit our stand, E14, at MIPIM to meet with the Council team. We are anticipating yet again, a very busy, but well worthwhile few days at the event. 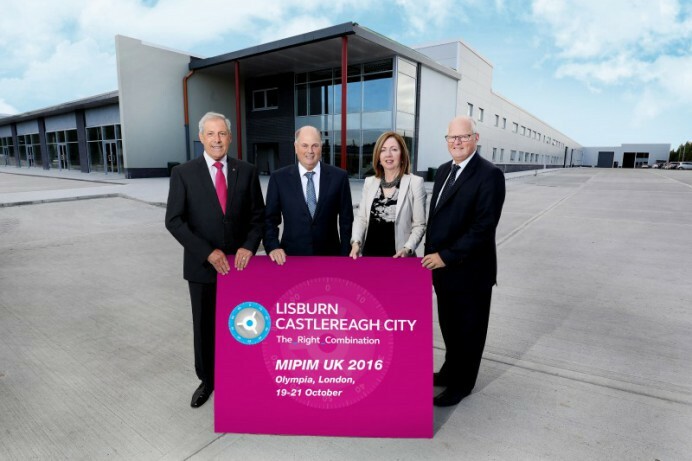 Dr Theresa Donaldson, Chief Executive of Lisburn & Castlereagh City Council added: “I am delighted that the Council is once again leading the way for local government in Northern Ireland by choosing to exhibit at MIPIM UK. We very much believe that the Council has a key role to play in promoting the City for investment, and the only way to do this is to get out and tell everyone why they should make Lisburn & Castlereagh their preferred investment location. “Within the Lisburn Castlereagh area there are a wide range of properties and sites available to cater for a variety of sectors. The area is not only attractive to multi-national companies it is home to a cluster of exciting, successful high technology companies producing a range of products and services from cloud computing solutions to advanced diagnostic electronic devices. To hear more about the range of properties and opportunities within the Council area visit Lisburn & Castlereagh City Council on stand E14 at MIPIM or tweet to @invest_LCCC and follow #LCCC_RightCombination. If you would like to book a meeting with the Lisburn Castlereagh Invest Team at MIPIM please email jamesgcca@gmail.com.